Nutanix has partnered with IBM to bring their Enterprise Cloud Platform software to the IBM Power System eco-system by supporting Acropolis and AHV on IBM OpenPOWER LC server hardware. 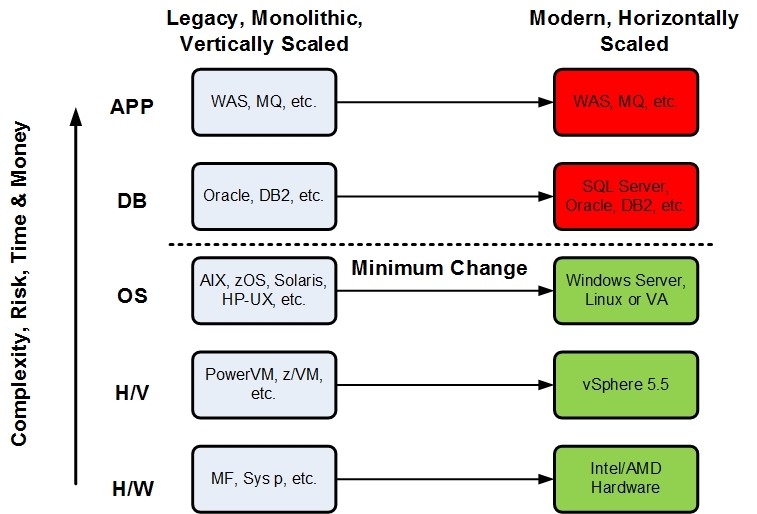 For those of you that wrestle with the transformation of non-x86 to x86 platforms, you will appreciate how this will simplify the consolidation process. In particular, this will allow you to simplify from an Application Transformation, Database or Guest OS migration to a Hypervisor/Hardware Migration. Which reduces risk, complexity, timeline and cost. The diagram below illustrates an example of non-x86 to x86 transformation. Will use the current IBM OpenPOWER LC platform hardware. Quotable in Q2/Q3 and Orderable/GA in Q3. AHV and Acropolis (CVM) have been compiled for the Power processor. Current cluster licensing will be valid for non-x86 and x86 clusters. Will support separate non-x86 and x86 clusters within the same Prism Pro instance. non-x86 and x86 AHV/CVM code will follow the same feature roadmap. All of the features in AHV/CVM will be available to the non-x86 cluster. Migrations from current IBM Power Linux systems to Power Linux on Nutanix will be using current methods, Nutanix will not be providing any custom migration tools. The “big endian/little endian” is not relevant here, since it is a Power System to Power System migration. Currently, Power Linux will be the only Guest OS supported. AIX is not supported at this time.